One of the last places on Earth where Sumatran elephants, tigers and orangutans coexist in the wild has received long-term protection. The Indonesian Ministry of Forestry approved a conservation concession – a lease of the land – covering 40,000 hectares of forest on the island of Sumatra. 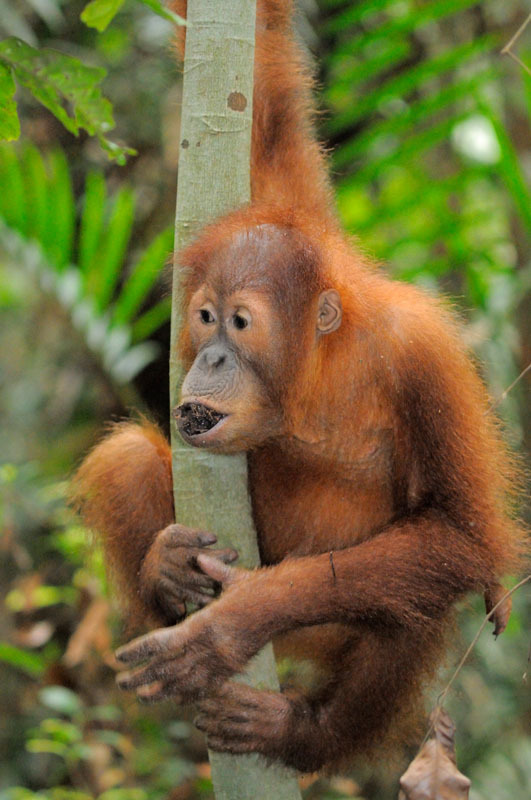 Through an ambitious project combining innovative financing approaches with traditional conservation, WWF, the Frankfurt Zoological Society (FZS) and The Orangutan Project (TOP) will join forces with local communities to actively manage the former logging forest, known as Bukit Tigapuluh (or Thirty Hills), to protect rather than exploit the land’s natural resources. The joint initiative in Thirty Hills ensures that some of the last unprotected lowland tropical forest in central Sumatra is formally zoned for restoration rather than clearing, and provides the conservation groups with a 60-year license to manage the area. The project effectively expands the protected forests of Bukit Tigapuluh National Park by more than 25 percent and encompasses an essential natural habitat for endangered Sumatran elephants and orangutans. The multi-year effort to protect Thirty Hills' extraordinary forests and biodiversity highlights the importance of partnerships and persistence for conservation success in challenging environments. WWF-Indonesia and Michelin are partnering in Thirty Hills on sustainable rubber production and reducing human-elephant conflict on a Michelin rubber plantation. FZS is working with local communities to enlist them as partners, and one of the early champions of the project, the Leonardo DiCaprio Foundation, has provided funding and advocacy support since 2010 to WWF and its partners. “I am honoured that my Foundation was a part of the effort to protect the Thirty Hills for the future. This incredible place – where elephants, orangutans and tigers coexist in the wild – is also one of the most threatened,” said actor, environmentalist and WWF-US board member Leonardo DiCaprio, who helped to focus global attention on the need to conserve the area. Conservation groups have been working since 1995 to expand Bukit Tigapuluh National Park to its originally intended size, which includes logging concessions that surround it. Over the past few years, WWF and other groups have cultivated a broad base of support in Indonesia, including local and national politicians, communities and indigenous people. “Our work to protect this area is an example of what can be accomplished when concerned organizations, governments and individuals work together to create a future where both nature and people can thrive,” said DiCaprio. “To protect this landscape, WWF and its partners had to think big, and think differently." To achieve this conservation milestone, WWF established a commercial company to oversee the “ecosystem restoration concession” with the partners and will look for wildlife-compatible ways to generate revenue to support protecting the forest, including selling rattan, tapping shade-grown “jungle rubber” and harvesting medicinal plants in the forest. Sumatra has the highest rate of deforestation on the planet, and has approximately 130,000 square kilometres of remaining habitat for wildlife, only one-third of which has some form of protection from development and logging. Since 1985, Sumatra has lost at least half of its forest cover, and species like elephants, tigers and orangutans are getting squeezed into shrinking islands of forests in a sea of palm oil and pulp and paper plantations. 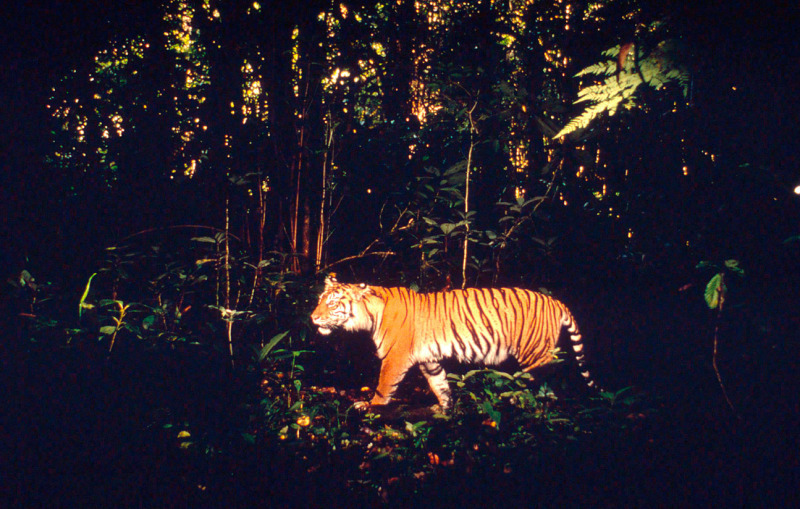 The Indonesian government singled out the Thirty Hills at the 2010 tiger summit in Russia as one of six priority areas for the critically endangered Sumatran tigers. 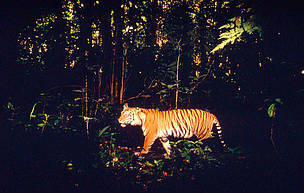 There are estimated to be 30 living in Thirty Hills, along with more than 120 Sumatran elephants and 160 orangutans. 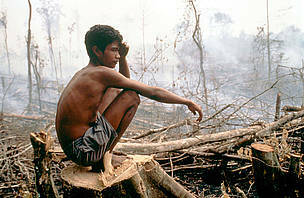 The area is also home to two forest-dwelling indigenous groups. Some areas will be set aside to help them improve their livelihoods. Most of the orangutans are survivors of the illegal pet trade and are part of the only successful reintroduction programme for the Sumatran orangutan led by FZS, TOP and the Indonesian Ministry of Environment and Forestry. 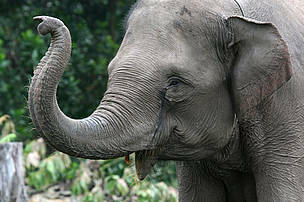 Sumatran elephant (Elephas maximus sumatrensis). Young orangutans are exercised and "educated" in the forest for a few hours every day at the Frankfurt Zoological Society Orangutan Reintroduction Centre, Jambi, Sumatra, Indonesia.